Can LeBron James’ new reality competition show distance itself from the pack? LeBron James might have finally found his first real challenge in the television game. The debut of his new CBS reality show, Million Dollar Mile, drew less than stellar ratings Wednesday night despite a promising lead-in from network stalwart Survivor. As a producer, James is best known for shows that reflect his social justice interests, such as Warriors of Liberty City, Shut Up and Dribble and Student Athlete. Million Dollar Mile is a lighthearted departure that pits amateur athletes (who are given a two-minute head start) against pros who excel at things like Tough Mudder, CrossFit, Spartan Races, etc. Million Dollar Mile defender Isaiah Vidal (left) races to scale a building before runner Kenny Bennett (right) can catch up. Flies on the wall – It’s described as a parkour obstacle, but it’s really more of a test of how well you’d do hanging onto the ledge of a building and then scuttling from that ledge to another for about 80 or so feet. Spiraling up – A bunch of vertically arranged honeycomb-shaped platforms. 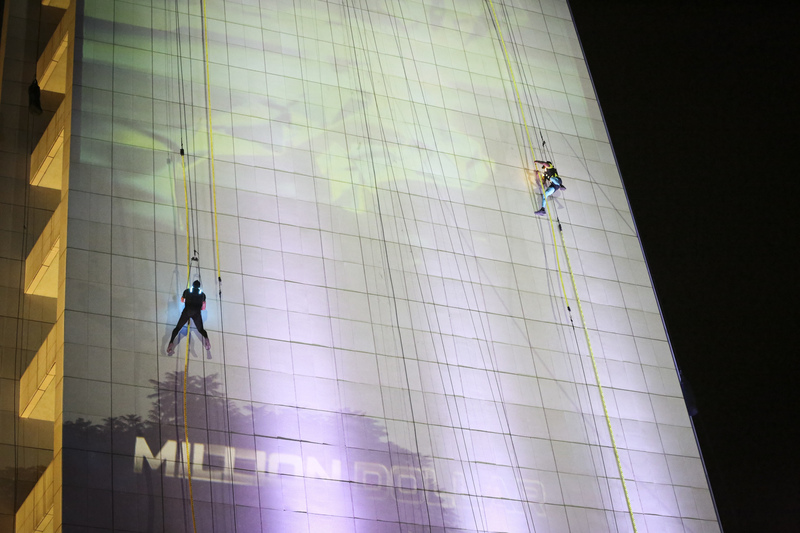 Competitors must pull themselves up until they reach the last platform, then bungee jump to the ground. Each challenge is worth more than the previous one. If you decide to quit after, say, three challenges and $50,000, you get to keep the money so long as you beat your opponent at scaling a building. But if the opponent wins, the competitor forfeits everything. No one got past more than two challenges in the pilot. The show possesses the same sort of professional gloss we’ve come to expect from a King James production. But will anyone miss it if it disappears from the CBS prime-time lineup? Give it a few weeks and we’ll know.